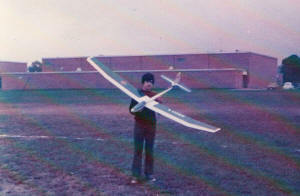 Back around 1975 or so, RC Modeler magazine ran a feature on a design by Lee Renaud called the "Aquila." It had incredibly graceful lines. 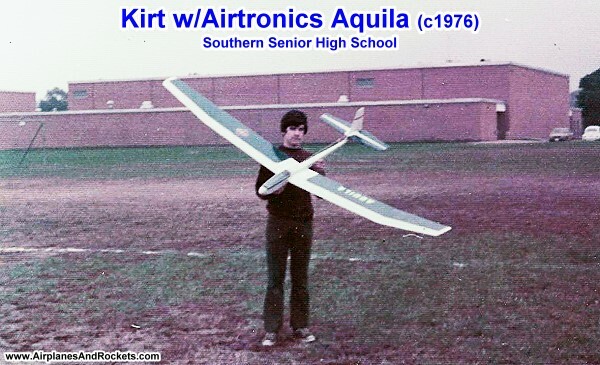 Airtronics had not yet produced a kit for it, so I ordered plans and built one from scratch. An unplanned landing caused its demise, but by that time a kit was available, so I purchased and built another Aquila - it was a lot easier that way. It followed me to Robins AFB while in the USAF, and there I eventually bought an ABS plastic fuselage to replace the beaten-up wooden one. I don't recall what eventually happened to that one, but I think I sold it. Video now available of 100' UpStart launch to a 15-minute, 1,232-foot thermal flight! A couple years ago, I bought an Aquila kit off of eBay, and then ended up re-selling it later. I wish I hadn't done that because they are rarely seen. 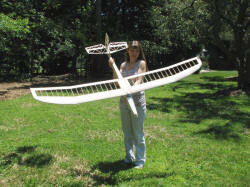 Plans are available now for the Aquila; however, I really didn't want to cut out all those parts again. 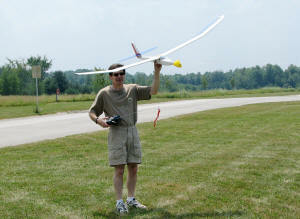 So, instead, I decided to buy a Great Planes Spirit 2-meter sailplane kit and "bash" is a bit to resemble the Aquila. The result is what you see in the photos on this page. It's not an exact likeness, but the lines are definitely more graceful that the somewhat square Spirit. 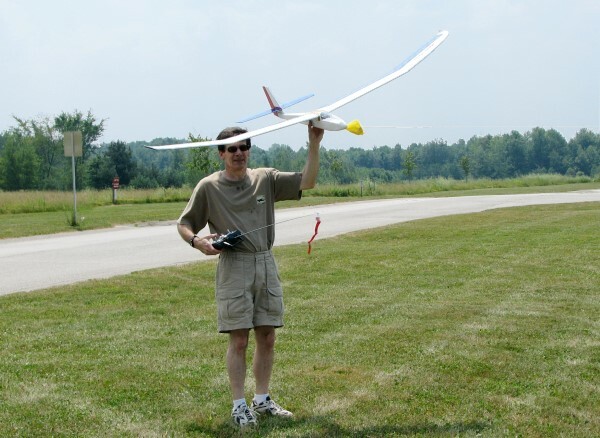 I have dubbed my new sailplane the Aquila Spirit, both to recognize the contributions of both models as well as to suggest the intention to build a model in the spirit of the original Aquila. Modifying the Spirit kit was not a lot of extra work, and the additional materials necessary are minimal. 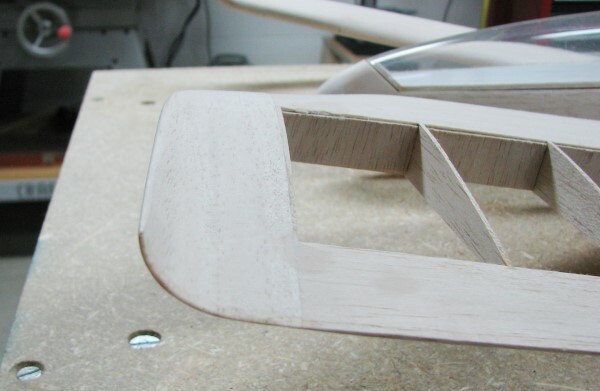 For instance, the added curvature at the bottom of the forward fuselage was accomplished by simply super gluing the die cut balsa back in place in that area, then cutting and sanding the new profile. The exact shape is not critical - just get some curve in there. I also replaced the 1/8" square fuselage edge balsa with 1/2" and 3/8" triangular stock to allow for more extensive rounding than what is possible with the stock Spirit. The Aquila had a very rounded shape, more even so than what the Aquila Spirit has. Photos are provided below. The biggest change is in the empennage area with the following changes. Photos are provided below. Move the horizontal stabilizer/elevator up on the vertical fin rather being flush with the top of the fuselage. Change the rudder to sit between the elevator halves, and extend it to the bottom rear of the fuselage. 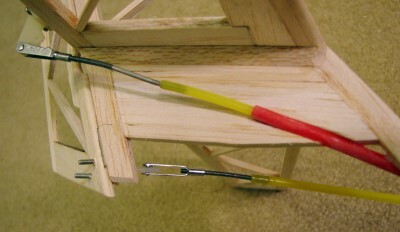 Change the elevator from the single, unbroken strip of tapered balsa to a built-up, split planform with a dowel connecting the two halves on either side of the rudder. 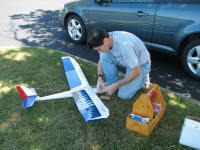 Shorten the fuselage slightly to compensate for the empennage being shifted rearward. 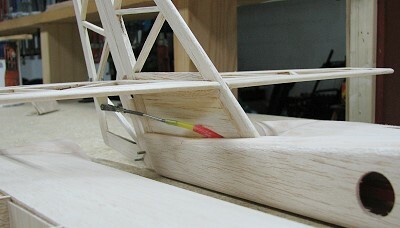 Locating the horizontal stabilizer on the rudder requires strengthening the vertical fin structure and attaching it firmly to the fuselage, since it will be carrying the load of both control surfaces. These photos show what was done. 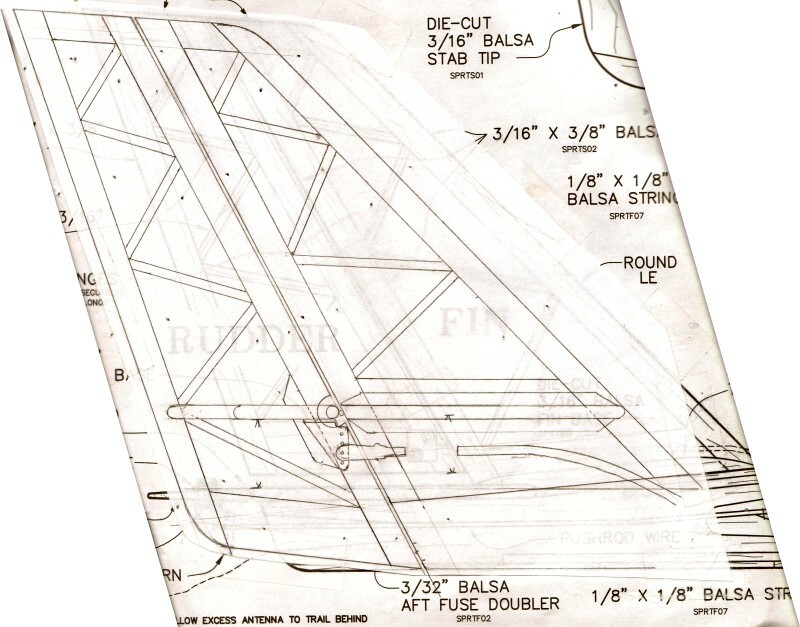 The vertical fin frame pieces extend to the bottom of the inside of the fuselage, being sandwiched between the sides at the very rear, and by the top sheeting at the front. I used medium hard balsa for those pieces for strength. Sullivan nylon pushrods were installed to accommodate the rather tight linkage hookup. I like to install the hinges prior to covering in order to avoid the hassle of trying to glue them later without making a mess. To do so, I cut the clinched ends of the hinge pins, do the installation and all the shaping and sanding, and verify bind-free pushrod movement. When it is time for covering, the hinge pins are removed and control surfaces separated. Then after covering, I insert new straight pins into the hinges and clip the excess with miniature diagonal cutters. The new clinched area will prevent the pins from working out. 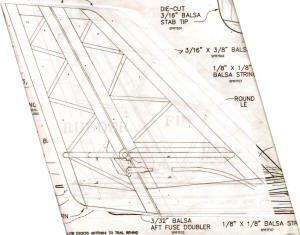 Here are the plan modifications for the empennage. The front vertical fin balsa stick extends down to the inside bottom of the fuselage. 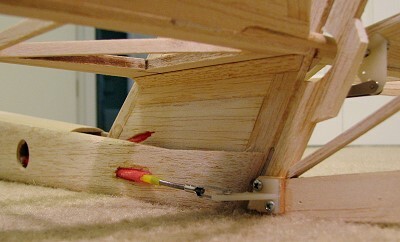 The back stick is sandwiched between the rear fuselage sides. Dimensions are super critical. You will find with the sizes I used that the control surface throws required are less than with the original because more area is presented to the airstream. I deliberately allowed the ghost of the original plans bleed through so you can compare the modifications to the original. Of course, the Aquila wouldn't be the Aquila without those nifty curved, upturned wingtips! Carving them is not all that difficult, and since the both the inside and outside of the shape is simple (i.e., not complex, only curved in 2 dimensions), even covering with Monokote is easy. If I recall properly, the original Aquila used a piece of 1/16" wire along the thin edge for protection, but for the Aquila Spirit, I soaked the finished edge with thin CA glue. 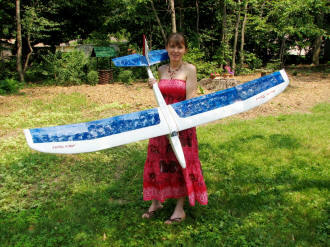 Photos of the completed airframe are given below. Final weight, including 2.7 ounces of lead in the nose for balance, ended up at 33.7 ounces. Great Planes says it should weight 30 ounces. The last 2-meter Spirit that I built as an unpowered glider weighed 31.5 ounces, but that was with a one-piece wing (the plywood/aluminum joiner weighs 0.9 ounces) and it had miniatures servos. Together, that about makes up for the difference. Any performance degradation due to the additional weight will probably never be noticed, especially here in Erie, PA, where the usually windy conditions benefit from a little extra ballast. Finally, my method for making really nice lettering (and other shapes) is shown to the left. I print out the letting on standard 20# paper and tape it to the Monokote. Then, carefully cut through paper and Monokote to get the shapes. 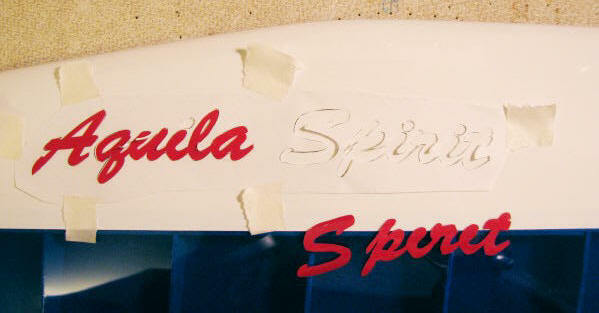 Take the paper stencil that results and tape it in place where the lettering goes, then tack the letters in place. Use a low heat so as not to make the file shrink. Finally, remove the paper and seal the letters completely to the airframe. August 7, 2010, at the Erie Tech Center (Summit, PA).